BOB MARLEY & THE WAILERS Live! (Official 1975 UK 20" x 30" promotional poster for the live album recorded at the Lyceum Ballroom, London on 18th July '75. 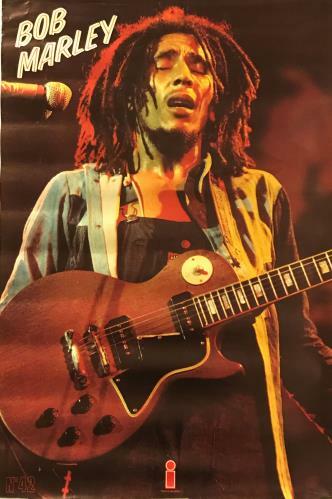 This vintage poster is the same colour, size, image & layout as the bonus poster that came with the album, depicting Mr Marley live on stage, with the 'No.42' printed bottom left & the Island logo in red at the bottom. All posters that came with a limited supply of the first LP batch were folded both vertically & horizontally in order to fit inside the jacket. This rare example was originally intended for display to help push the release of the record. It remains UNFOLDED & is stored rolled & unbacked, with no pin-holes. The condition is Excellent, with a few light edge creases in the corners & no writing or tears. Hard to find! ).